This cookie crust is very reminiscent of a classic graham cracker crust, except it is safe to eat. You really can’t mess up this recipe, it is a simple cookie-like crust. No chilling or rolling out the dough required. The mixture will seem crumbly, but if you work it with your hands and press down into the pie plate, it will hold together. Stir together all ingredients, until combined. 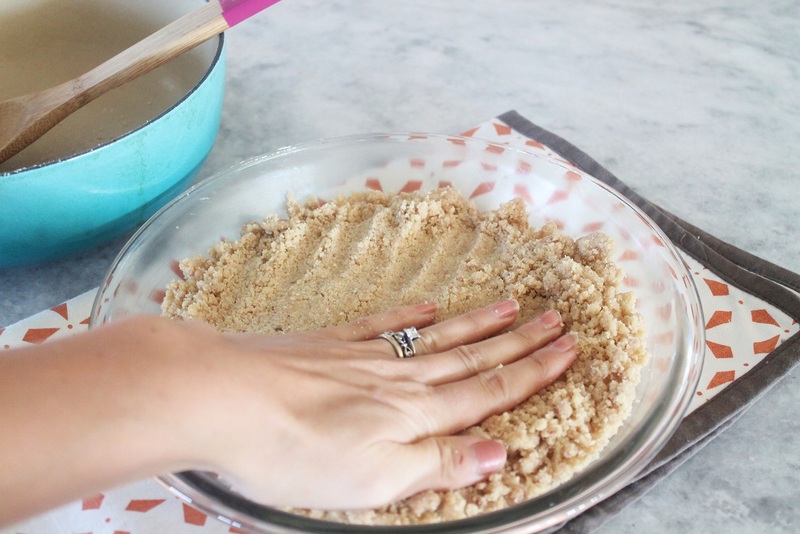 Spread mixture using your hands, into a greased 9 inch pie plate. Bake for 12-16 minutes, until golden brown. *For a dairy free version, substitute the butter with 5 tablespoons coconut oil. I wonder if we could transform this crust recipt into an actual graham cracker recipe? Of course I wouldn’t have the first clue as to how much of each flour to use or any of the other ingredients because i’m so kitchen challenged!??? But I did just buy my first large food processor! I’ve been using my 1 cup processor to make the Chedder Cheese crackers and boy was that a challenge! Anyway, if you have any time let us know if you experiment with this recipe into a snack cracker! Snacks are a big challenge around our house! Again, your blog always blesses me! That sounds like it needs to happen. I’ll add it to my “to do” list! And I am very glad you got a larger food processor, that must have been tough! I found your website yesterday and immediately made the chocolate chip cookies. I was diagnosed with Celiac last year and my oldest daughter was just recently diagnosed. This is the FIRST recipe made without rice flours that she actually liked. I actually cried. I cannot begin to tell you how exciting it is for someone like me to find your website. I have read every recipe you have in the last two days. I have a passion for health and nutrition and I just could not justify using rice flours and potato starch and refined sugars- not to mention they have such a gritty mouth feel. I thank you from the bottom of my heart. Today, we are going to try your version of Cheez its – my daughter’s favorite crackers. Bless your heart! You are about to make me cry too! It can be hard switching over to gf cooking and figuring out which ingredients work best for you. I’m glad to have you here and I appreciate your very sweet comment. I am just starting out as personal chef and learning about the gluten free diet and celiac disease. Thanks for sharing recipes. I am going to try some out. One question, where do you find the nut flours or do you make your own? Do they have them at Whole Foods? I actually purchase my flours online -http://glutenfreefix.com/ingredients/ – the links are on this page. They do sell nut flours in health food stores, but are generally overpriced and the quality is lacking. Making your own nut flour is acceptable, but time consuming. I have found it is difficult to get the texture “just right”. Good luck! What is the best alternative to almond flour? Or mix of flours? I have an almond allergy! Are you allergic to all nuts? Another nut flour like pecan would work. Nut flours work a bit differently than others, so it’s hard to replace exactly and know if it would turn out. I’m working on a nut free crust, and will be posting it soon! My Daughter is 12 and we found out when she was 9 that she has Celiac and it was really hard for us as a family to try and help her with SO many foods having wheat…You don’t realize how much until this happens. I’m wondering about something. Is almond meal the same thing as almond flour? I have some almond meal and use it in several of my cookie & muffin recipes. If it works in this crust recipe it would be wonderful. Thanks for all of the great recipes and information!! Almond meal is almond flour, but the skin has not been removed. Therefore it is darker in color and not quite as smooth in texture. It works great in certain recipes, like crusts and cookies. However for the best results in cakes and recipes where a lighter texture is desired, it is best to use blanched almond flour. Reading the precious comments to this post made me cry. Due to being diagnosed with cancer in 2007, I have been “gluten-free” along with dairy f, sugar f, soy f, corn f, and caffeine f for several years now. Sometimes it is extremely difficult to find foods that are “free” of all the above…At the natural grocers where I shop, I read labels like crazy and often put things back on the shelves. When cooking, I have to make many substitutions. I never knew about this world of food blogging until a year or two ago. It has become a wonderful support group for me as I read of other’s struggles. Sometimes it seems like it, but, I’m NOT the only person out there who has to deal with food issues! There are too many reasons to list here, but I never physically joined any celiac support groups when I was diagnosed w the stage IV ovarian cancer. I wanted to say THANK YOU for all you do for people who have health issues and need alternative ways of eating. 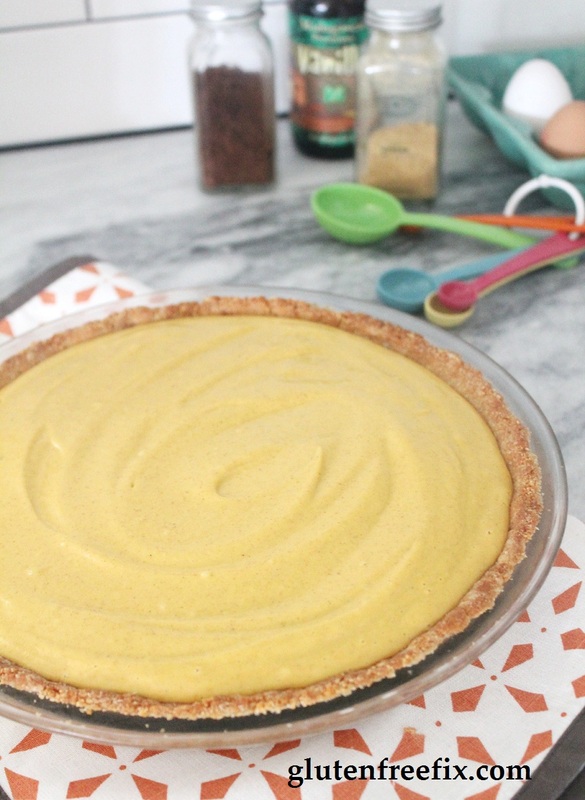 This pie crust recipe looks awesome, and I’ll be trying it soon! Just found your page on Facebook, thanks to a friend. Thanks for all the tips and the great sounding recipes. Also will check out the website to buy nut flours – have been buying them at the health food stores. Will try the graham cracker crust – sounds yummy. This looks great, but I’m wondering if it would work for a fruit pie? 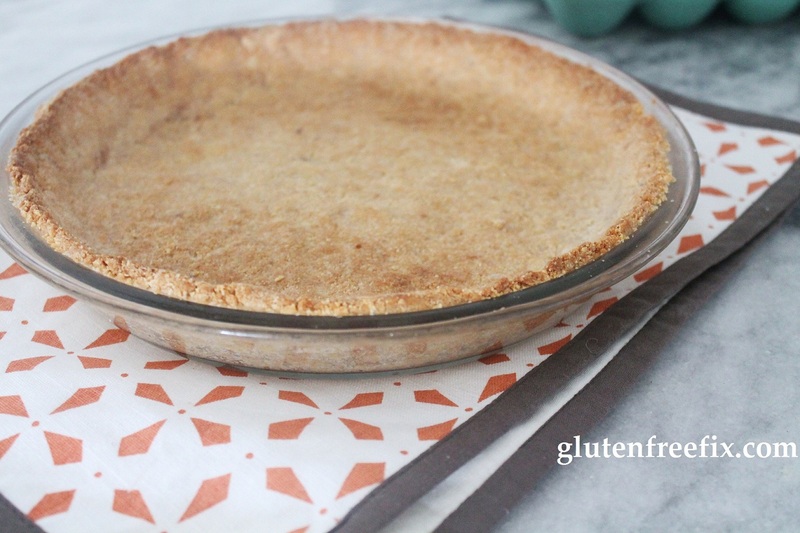 I know usually for fruit pies (I’d like to do strawberry-rhubarb) you don’t pre-bake the crust. Do you think if I half-baked this crust then filled it and continued to bake it would turn out alright? There are two different ways to go about it. 1) Cook your pie filling over the stove and then pour into your pre-baked crust or 2) Prebake the crust for about 7 minutes just enough to set, then add filling and bake until cooked thru. I’d love to hear how it turns out! Great recipe! I substituted the honey for agave nector (vegan version and low glycemic index than honey) and it worked beautifully! I was looking for an alternative to the usual graham cracker crust I used to use for my cheesecake, and this worked perfectly. Because it was a ‘bake’ cheesecake, I only put the crust in for 10 minutes, then pulled it out to add the cheesecake mix to it (to bake for another hour), and it turned out wonderfully! And if anyone is interested, I’ve posted below the recipe for the cheesecake, its super easy and delicious (and gluten-free)! Beat cream cheese and sugar in a mixing bowl. Add vanilla. Beat in eggs one at a time until well mixed. Pour over crust. Bake for 1 hour at 300 or until center is firm. Cool and top with cherries. Chill for 3 hours. 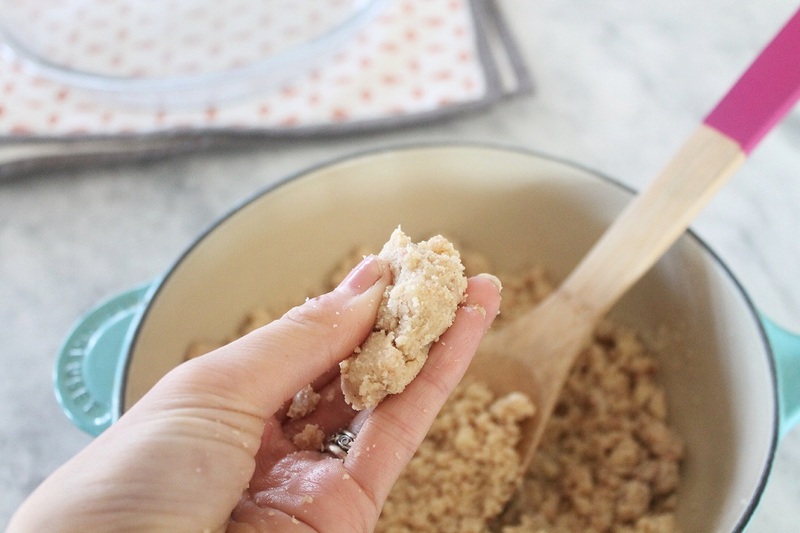 Thanks so much for this post… I’ve probably spent an hour today searching for input on how almond flour graham crusts do with cheesecake… and here is my answer! :) Now I can feel more confident about using this recipe with my guava cheesecake! Thanks to both of you, Elise and Michelle! Instead of butter what other substitution would you recommend, I saw coconut oil, but is there anything else? I have only used coconut oil and butter in this recipe, but I have seen others use another type of oil, like grapeseed. Let me know what you try and how it works out for you! Would I be able to use GF All-purpose baking flour in place of the Almond flour? I just found out I have a wheat sensitivity-rash, headaches, dizziness, so I am going wheat free now. I made this crust with key lime filling for my Thanksgiving dinner dessert yesterday. I LOVED IT!! I am looking forward to trying some of your other recipes. Thanks!